"We're getting a lot of positive feedback." 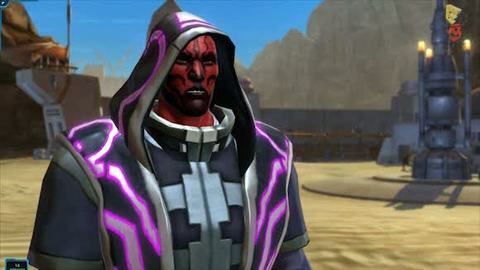 Development of Star Wars MMO The Old Republic is "progressing well", BioWare has said. BioWare bosses Ray Muzyka and Greg Zeschuk said the game is shaping up nicely, and its E3 hands-on showing sparked positive feedback. "Things are tracking well," CEO Ray Muzyka told Eurogamer. "We're progressing well. The fact we're showing it hands-on on the show floor is an indication of our confidence in the quality. We're getting a lot of positive feedback on that. "We know how critical it is to launch as a solid game and then have really high quality service afterwards, too. "We have plans to do follow-on content and things that'll keep our players engaged and active for years to come." Fellow BioWare co-founder Greg Zeschuk echoed Muzyka's comments. "The content's getting there," he said. "We're pretty happy with what we're showing. There's always a lot of refining and polishing. "We've pretty well announced the whole range of features. There's such an incredibly large range of things, like crafting, heroic combat, PVP, war zones, end game content – what we call operations, which are basically raids, companion characters, there's all this stuff. "All those things all together are looking good. "It's not just enough to make the game great. You have to give great service and you have to be able to support the game on a long-term basis. So we've devoted a lot of effort and thinking towards how we do that. "The beta testing really is a validation of that stuff. At some point we'll be ready to go." Analysts have predicted that the game will be delayed into 2012, although EA has officially pegged it for release this year. "In a formal sense EA's guided towards this calendar year," Zeschuk said. "That is what the big men have said. "At the end of the day quality also matters. And quality of service just as much as quality of game." CORRECTION: We have altered this story to accurately reflect the timing of Eurogamer's E3 2011 interview with BioWare, which took place before Cowen and Company's comments on the game were made public. The interview was not intended as a response. Eurogamer apologises to BioWare for any offence caused.